Cameron is guaranteed to create a grand entrance. Layers of fantasy organza ruffles create a unique look for this asymmetrically dropped waist A-line gown. 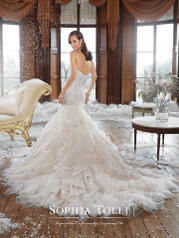 A slimming bodice with a strapless sweetheart neckline features hand-beaded delicate lace appliques. A back corset and chapel length train as well as removable spaghetti and halter straps included. Also available with a back zipper as style Y21511ZB.